The 3GP files were designed to save on data usage, bandwidth, and disk space for video files. The problem with using 3GP video files is that most programs on Windows do not open the files, which means that you have to convert them to a different file type like AVI. Converting a 3GP to AVI is simple and only takes a few minutes. In most cases, using a desktop video file converter for 3GP to AVI is the best option for Windows since there is less compression of the video file. Wondershare UniConverter (originally Wondershare Video Converter Ultimate) is the most popular option, as it has many built-in features. There is also a free trial that you can try if you are not sure how often that you are going to use the program. To use a desktop converter like Wondershare UniConverter (originally Wondershare Video Converter Ultimate), you will first need to pick the version of the program and download the programs. Once the download is completed, install the program on your computer. This will only take a few minutes, and you may need to restart your computer once the install is complete. Once you have the program installed, open the program and import the 3GP file that you want to convert. You can do this by dragging the file into the program or using the menus to find the file. If the 3GP file needs editing and you are using Wondershare UniConverter (originally Wondershare Video Converter Ultimate), you can do all the editing in the program before you convert the file. Then you need to select the file type that you want the output format to be, which AVI is and click the Convert button. This will take some time depending on the size of the files that you are converting. Briefly speaking, have your 3GP files ready and go to the Zamzar website, then upload the files using the uploader on the Zamzar website. Once the files have uploaded to the converter, you should select the output format of the file to AVI, the quality you want the output, and click the Convert button. 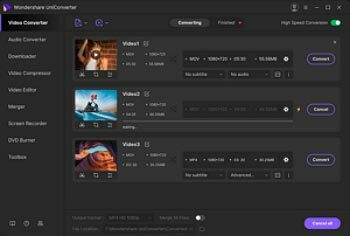 If you need to make any edits to the video file, you should edit the file with the tools from Zamzar. Zamzar also gives you recommendations about the file types that work the best for devices like iPhones, Galaxy S7, and more mobile devices, along with Windows and Mac OS. You will need to wait a few minutes for the conversion to be completed and the file to be downloaded. Once the file is downloaded, you are able to open the video file with any of the programs that you have installed. If you need help during any part of the conversion process, there are videos that you can watch to see if you are able to fix the problems. Here is a comparison of the three of the most popular 3GP to AVI converters.